According to the Law of Ukraine “On the confirmation of conformity”, a document that meets all the requirements regarding the requirements and norms of a specific standard, as determined by the current legislation, is a certificate of conformity. Certification is a procedure by which a body (DSTU) recognized in accordance with the established procedure, documents the conformity of products to all requirements established by the legislation. According to the State Building Regulations, there are certain criteria for “Fire Safety of Construction Objects” (SBR .B.1.1-7-2002), which explicitly provides warnings regarding the spread of fire in buildings. Among the whole list of requirements there is also a clause regarding the presence in the apartments, offices and premises of special purpose of the entrance of certified fire doors, and the mandatory formality is the presence of a certificate of conformity . 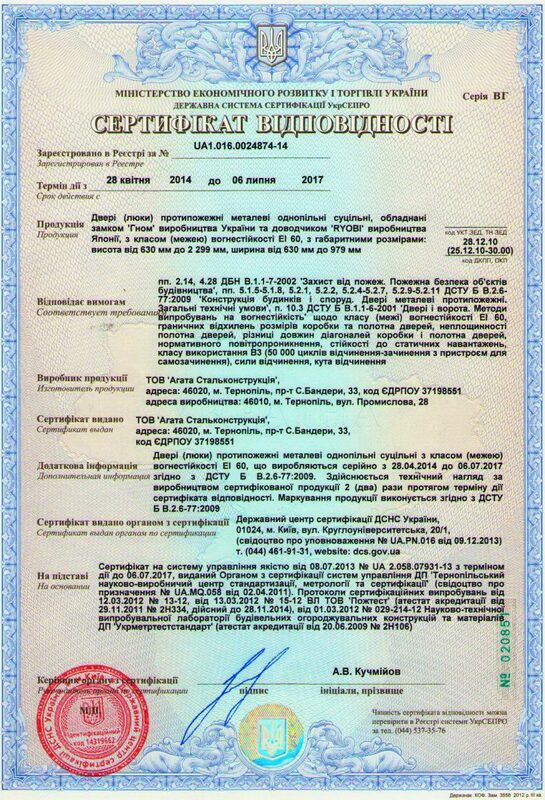 According to this document, the marking of products DSTU B V.2.6 77: 2009 and the conformity mark according to DSTU2296-93, which is applied to each product of serially manufactured products, is carried out. Also in the SBR there are requirements for the installation of special doors of doors with increased durability, according to DSTU B.V. 2.6-11-97. It is precisely such products that meet the above-mentioned criteria, and the certified products of AGATASTAL. We manufacture the entrance metal fire doors with the limit of fire resistance EI 60, according to the certificate of conformity of series DI № 772626 issued by the State Certification System of UkrSEPRO from March 22, 2012. Also we manufacture and metal door shockproof entrance into apartments on the resistance of breakage of the first category, with the limit of fire resistance EI 30, according to the certificate series DI № 684108 of July 12, 2010. Before getting a certificate, the products have passed all levels of testing, in accordance with the requirements of regulatory documentation. Thus, the state-owned enterprise “Ukrmetrteststandart” tested the door to shock, air permeability and cyclicity (opening-closing 50 thousand times) and provided AGATASTAL positive test protocols and approvals about our products. Also, the testing laboratory of POZhteest LLC (Kiev) tested the door for fire resistance and confirmed its level – 60 minutes. In addition, another inspection authority – Sanitary and Epidemiological Station, has confirmed all the sanitary norms that were observed at the doors made, namely the safety of all components and working conditions. Thus, it is proved that the product meets all quality indicators and certification standards. The positive test protocols and the certificate of conformity that the firm has received is a confirmation of the quality and safety of the doors. The availability of this document helps buyers to choose products more competently and provides a certain guarantee of their quality. With the certificate of conformity, the company also issued a license agreement and a plan for technical supervision of the stability of certified products during its production. So, in the short term of its activity, AGATASTAL has managed to win a good reputation not only of a quality product, but also observing all standards for obtaining documentation for these products. All customers, when purchasing a door, are given a mandatory package of documents, namely: a contract (purchase-sale), a certificate of conformity and a guarantee voucher.